African Diaspora 0 Edition Patrick Manning refuses to divide the African diaspora into the experiences of separate regions and nations. Instead, he follows the multiple routes that brought Africans and people of African descent into contact with one another and with Europe, Asia, and the Americas. In weaving these stories together, Manning shows how the waters of the Atlantic Ocean, the Mediterranean Sea, and the Indian Ocean fueled dynamic interactions among black communities and cultures and how these patterns resembled those of a number of connected diasporas concurrently taking shaping across the globe. Manning begins in 1400 and traces five central themes: the connections that enabled Africans to mutually identify and hold together as a global community; discourses on race; changes in economic circumstance; the character of family life; and the evolution of popular culture. His approach reveals links among seemingly disparate worlds. In the mid-nineteenth century, for example, slavery came under attack in North America, South America, southern Africa, West Africa, the Ottoman Empire, and India, with former slaves rising to positions of political prominence. Yet at the beginning of the twentieth century, the near-elimination of slavery brought new forms of discrimination that removed almost all blacks from government for half a century. Manning underscores the profound influence that the African diaspora had on world history, demonstrating the inextricable link between black migration and the rise of modernity, especially in regards to the processes of industrialization and urbanization. 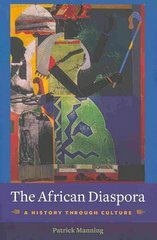 A remarkably inclusive and far-reaching work, The African Diaspora proves that the advent of modernity cannot be imaginatively or comprehensively engaged without taking the African peoples and the African continent as a whole into account.